Dimensions 2 by 8.50 by 10.75 in. Amazon.com description: Product Description: Designed for the three-semester engineering calculus course, CALCULUS: EARLY TRANSCENDENTAL FUNCTIONS, Sixth Edition, continues to offer instructors and students innovative teaching and learning resources. The Larson team always has two main objectives for text revisions: to develop precise, readable materials for students that clearly define and demonstrate concepts and rules of calculus; and to design comprehensive teaching resources for instructors that employ proven pedagogical techniques and save time. The Larson/Edwards Calculus program offers a solution to address the needs of any calculus course and any level of calculus student. Every edition from the first to the sixth of CALCULUS: EARLY TRANSCENDENTAL FUNCTIONS has made the mastery of traditional calculus skills a priority, while embracing the best features of new technology and, when appropriate, calculus reform ideas. 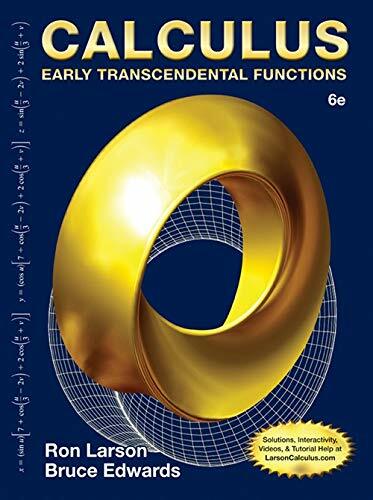 About: Designed for the three-semester engineering calculus course, CALCULUS: EARLY TRANSCENDENTAL FUNCTIONS, Sixth Edition, continues to offer instructors and students innovative teaching and learning resources. 5 stu sol edition from Brooks/Cole Pub Co (January 14, 2010); titled "Calculus: Early Transcendental Functions: Early Transcendental Functions"
About: This manual includes worked out solutions to every odd-numbered exercise in Larson's Single Variable Calculus: Early Transcendental Functions, 5e (Chapters P-11 of Larson's Calculus: Early Transcendental Functions, 5e).